However, the postulates of New Age, in spite of its mistakes, are closer to the truth than any other religion, and it is good that they support the disappearance of religions, because religion is in fact only an engram, which is irrational by definition. Dear Professor: I have searched the website of Grupo Elron and I couldn’t find anything related to the movement called New Age, I was so perplexed because this movement is acquiring a tremendous force in many sectors of the population, I would like to know the validity that this doctrine has from the point of view of the Masters of Light because many postulates coincide with those that you spread. The institution that has attacked more to New Age is the Catholic Church because it perceives a threat to its religious hegemony. And it looks like a joke because in fact it’s only mistakes fighting against mistakes. These strange words from the Pope John Paul II, attribute to the Catholic Church exclusively - the "real" knowledge of the God's word. In other words, the pope John Paul II said: "We are the only ones who know the word of God, therefore those who say different things are wrong". Where is the "God's word" for the Catholic Church? Of course, in the Bible! And what is the Bible? A series of historical events written by ignorant men - and often cretins - which texts later on were adapted, modified, altered, distorted and cunningly translated. Some texts were also erased if something was not convenient for the Catholic church. Everything looks like a joke because even the church lacks of legitimate existence since it was born after the words of the Master Jesus were obliterated: "The man does not need any mediator to go to the Father, because each one will emerge by his own effort and according to his works" that is to say, the Service to our fellow man. Few followers of New Age recognize that the name was used for the first time by Alice A. Bailey, who received the teachings of the Master Djwal Khul through mediumship. Although Djwal Khul is a member of the Planetary Hierarchy, these teachings were very distorted indeed, and they were spread in numerous books - being the first one "Initiation Human and Solar" - and through teachings given by the institution she founded the "Arcane School". New Age is also called "The Aquarian conspiracy". According to the "conspirators", the world would be entering into a New Age, surpassing the Christian age or the age of Pisces that is to say, we would be in front of a new era or a new way of seeing and understanding the relationship of people with the universe. 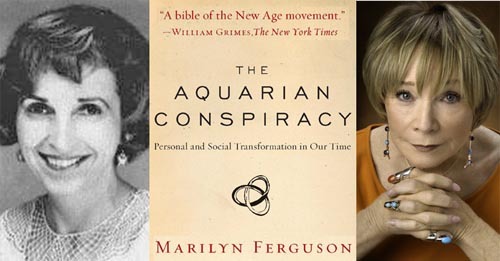 Marilyn Ferguson, author of “The Aquarian Conspiracy” a real "bible" of the New Age movement - reports how she adopted the concept of "conspiracy" (literally: to breath together), inspired in the French Jesuit Pierre Teilhard de Chardin, to express a vast network of people and institutions that try to transform deeply the way of organization of the human coexistence in the world. But this new spirituality is not related to religious beliefs we know up to this day, but it discards any institutional mediation, placing the personal relation with the mystery of the sacred in the first place. In addition, the true way of salvation the Master Jesus came to show us is the spiritual elevation, specifically from the planes of error to the planes of Light, the only salvation that exists is through Service to our fellow man and not by rites, prayers and tithes that only contribute that religious nonsense continues. First of all, New Age is not a structured movement; it hasn’t declared leaders, dogmas or hierarchies. It is not considered a "new religious movement", or what is even understood as a "cult" or a "sect", it’s definitely not a "religion" either, although their members recognize the sincere character of the quest of the meaning of life also. New Age followers deny that it should be a religion because they think that the age of religions is over and therefore to say that it’s a religion would be against their own principles. We would guess right if we catalog New Age as a movement that tries to conciliate different doctrines (syncretism), and to which many people adhere being spontaneously related to its fundamental objectives. Some of them claim to see in New Age a universal movement and social and cultural character that constitutes a new way of thinking with some Gnostic and esoteric contents which spread diverse experiences in music, movies, theater, meditation, etc. Inside New Age there are also several groups and organizations, many of them have sectarian characteristics. Nevertheless, in spite of the absence of concretion, New Age approaches more to the truth with its postulates like no other religion has done it before. And here is the real problem because New Age mixes truths with falsehoods and New Age followers end up swallowing garbage. It is something similar to those who are lost in the desert and try to get out of it walking through the scorching sand: after some hours they find themselves in the same place they were in the beginning, with the logical desperation that they realize that they walked in circles. And this is the best definition of New Age. Now, Let's see some of the mistakes of New Age. The idea of the reincarnation is obviously an advanced idea compared to the stupid belief of some religions like Catholicism and Judaism which claim that we live only one life and our destiny depends on it, nonetheless, New Age uses the concept of reincarnation as an ideological base to justify abortion, among other things, For instance, they believe that it is not important to eliminate a human life if one is going to reincarnate after all. According to the masters of light, abortion is condemnable because it prevents the opportunity the spirit have to experience embodiment, which can help the spirit to learn some karma of past lives and evolve in this way. Even the mother can be involved in this karma and if she impedes a spirit to be born, she will also be preventing the learning of certain karma and therefore preventing her evolution. This means that a spirit will have to incarnate again - of course nobody is forced to embody, but it is a free choice of the spirit - to learn a lesson that the spirit had pending. Needless to say that this spirit could be embodying in the physical plane in a certain mission in order to find some cure for some illness or make some important discovery for humanity. The idea of New Age that the soul reincarnates over and over again to achieve its freedom from the cycle of birth and death by reaching "Nirvana” in the Absolute "Brahman" is quite preposterous. The truth is that the spirit only incarnates in a small percentage 10 %, remaining the other 90 % in its own plane, and the moment of disincarnation simply means to have conscience of being a spirit 100 % again, since both parts were never separated, but only with a provisionally division of conscience, staying one part in the physical plane and the other in the spiritual plane. In addition, even if the spirit had a "last embodiment", the spirit does not reach any "Nirvana"and it does not reach the Absolute either. The spirit simply "returns" to its own spiritual plane, which is in fact, is its real home. Naturally, in accordance with its behavior in the physical plane, the spirit will be able to raise up or lower down of spiritual plane. The “Paradise” is an egotistical invention of religions, obviously with manipulation purposes because in the planes of error (2 and 3) there are only fights for power and in planes of Light (4 and 5) there is Service. As for the spirit, it will be merged with the Absolute in approximately 25 billion years when the next Big Crunch comes. It is true that we face a serious problem of abuse that threaten the life on the planet and it’s necessary to wake up the conscience of the nations towards responsibility of conservation and respect for our biosystem, but New Age has carried to extremes these premises developing its own vision of the matter, to which sometimes it refers like "Deep Ecology", and in which it denies the difference between human existence and not human existence, speaking about a bio-centric equality for which a mountain, a flower or a turtle would have the same right compared to the realization of man. Although it is true that God is everything, and thereby he is in the grass, in a stone, in an insect, in a tree, in an animal or a man; not all of them are in the same level, since some have more priority than others. New Age, contrary to the personal God - different and superior to the created universe – from Catholicism and Judaism, considers God as an impersonal divine force that it’s everything and everywhere. This stance, which is correct, has been one of the reasons for which the Catholic Church attacked New age because it considers that New Ager returns to the naturalistic pantheism, which was definitely eradicated by the “Christian revelation" (?). Gnosticism adopted by New Age constitutes a flagrant mistake because the Gnostics believe that the Sacred Writings have a hidden message that only certain illuminated minds can decipher. Although we have said it many times, it’s necessary to repeat that the Bible has been written by ordinary men who received messages from the spirits of error and who mistakenly interpreted the channeled messages of beings of Light. The derivation of Gnosticism, present in all the big religious traditions, has survived and it has been diversified finding in New Age a privileged field of action. The Theosophical Society, founded by Helena Blavatsky at the end of last century and its derivations of related organizations (Anthroposophy, the Universal Brotherhood, the Rosicrucian Order, The Church Universal and Triumphant, the current of the Metaphysics represented in Mexico by authors like Connie Mendez, the Religious activity "I am", the New Acropolis and many others) are the ideological precursors of New Age and at present they are its dedicated promoters. The symbols, the ceremonies and the initiatic grades of Freemasonry and paramasonic organizations also reveal a narrow association with Gnosis. These doctrines were received by New Age, each one with its own nonsense, which we have often emphasized. This fact indicates undoubtedly that New Age followers have ignored the clear warning of the Master Jesus: " no one puts new wine into old wineskins; otherwise the new wine will burst the skins and it will be spilled out But new wine must be put into fresh wineskins. (Mark 2, 18-22). The phenomenon of New Age is so complex and reluctant that it could be hardly defined exactly. And it is due to its virtue that in the same way as we have emphasized that New Age doesn’t bring something new and it is a kind of cocktail based on previous doctrines, which extracts truths (scarce and badly understood) mixed with falsehoods (many and ludicrous). Hence, he would not have to repeat the criticism already said about philosophies that are part of New Age, like Gnosticism, the Rosicrucian philosophy, Freemasonry, Metaphysics of Conny Mendez, the Gnosis of Samael Aun Weor, the hallucinations of Carlos Castaneda, etc. I hope that in spite of the difficulty of explaining something so evasive like the New Age movement, at least some negative aspects are finally exposed, of course, a philosophy not entirely right to be part of it. John Paul II, Crossing the Threshold of Hope, (Knopf) 1994, 90. This entry was posted at Wednesday, April 07, 2010 and is filed under Who are they? . You can follow any responses to this entry through the .